UNCTAD's 2015 Information Economy Report has as its theme e-commerce for developing countries. 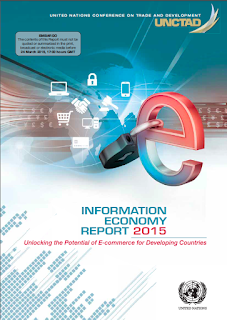 A tool included in the report is a B2C e-commerce index that allows countries to benchmark themselves against others and gauge their strengths and weaknesses in various e-commerce aspects. The selection of indicators for the index was made in several steps. First, proxy indicators were assigned to the various elements needed to fully carry out an e-commerce transaction including payment and delivery. This includes access to the Internet by the consumer, a web site to receive the order, a payment method and a delivery method. 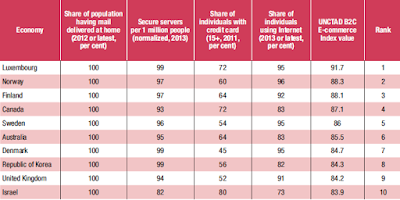 Second, a statistical analysis was performed by regressing these indicators on the percentage of individuals who have made an online purchase for 77 countries where such data was available. Indicators with the highest statistical significance were then selected to create the index. These indicators are shown below. The results of the regression show a good fit, with a coefficient of determination of 0.85. 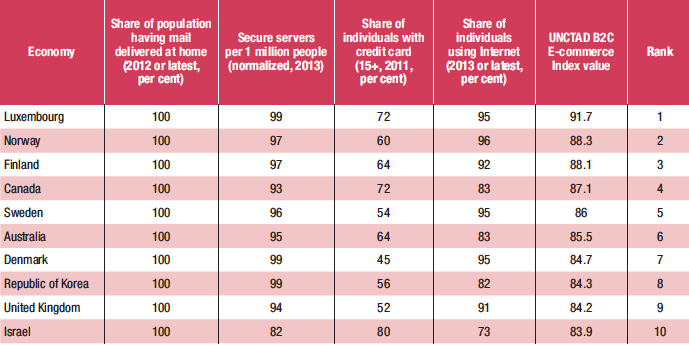 All indicators, except secure servers, are in a normative form where 100 is the maximum value. The data on secure servers were normalized to 100 by rescaling the values. The values of the indicators were then averaged to obtain an index value. The index comprises 130 economies with all available indicators using data for 2013 (or latest year available). Several observations can be made about the highest ranked economies. Firstly, most are from developed economies. Secondly, most are relatively small and/or distant from major market centers. Smaller physical retail markets appear to stimulate online shopping including a significant amount from abroad. The top ten ranked developing economies in the index are all upper-middle and high-income economies, six of which from Asia and the remaining four from Latin America.